Stories are the anchor of cultures and civilizations both ancient and modern. They connect people in powerful ways. In the comparative literature major, you’ll explore how literature — as well as film, music, and new media — can build bridges across national borders, languages, and historical eras. You’ll enjoy a wide-ranging, multicultural program of studies, building your expertise to identify and examine an author’s message, intended audience, and communication techniques. Through coursework and collaborations with faculty, you’ll hone your critical thinking and writing skills, and gain a nuanced understanding of cultural differences and diversity. As you do, you’ll grapple with some of life’s most important questions, and develop an understanding of the human experience. Why Study Comparative Literature at Clark? 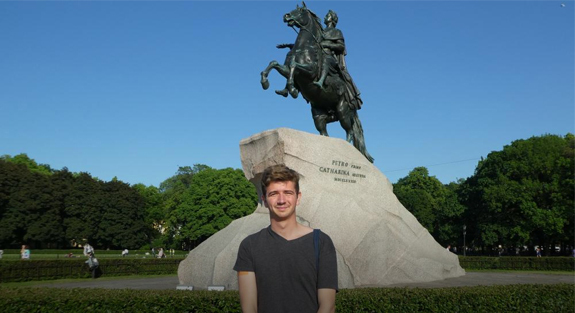 Study in a diverse, multicultural environment, and explore learning opportunities abroad — students previously have taken classes through Clark’s Henry J. Leir Luxembourg Program, and one Clarkie completed his LEEP project through a 17-day journey on the Trans-Siberian Railway. Challenge and critique social constructions through robust literary analysis — from the concept of nationalism to the notion of human rights as debated during the Age of Enlightenment. Build competency in a language other than your own, and demonstrate your knowledge by completing a literature course in that language. For his LEEP project, Aviv Hilbig-Bokaer, a double-major in comparative literature and international development and social change, immersed himself in the Russian literary canon while journeying 7,000 miles on the Trans-Siberian Railway during the summer of 2016. He later received a grant from Fulbright Austria to teach English to high school students in Vienna. This experience has given me such an incredible amount of insight into how I interact with literature and what it is about texts that I value. Literature is such an important component to understanding cultures and building bridges between others and myself. The comparative literature major is one of several offered through Clark’s Language, Literature and Culture Department. As a comparative literature major, you will take at least eight courses in literature, film, or related arts from several departments and programs, including language, literature and culture; English; art history; screen studies; and theatre arts. These courses must include The National Imagination and a capstone course. Courses in the major emphasize a critical approach to texts, with an eye on their cultural influences and impact. This approach may take the form of play production, seminars in the translation of lyric poetry and drama, and supervised work in contemporary critical theory (i.e., relations between text and performance, spectator positioning, and reader response). You also are required to take two courses in a foreign language at the intermediate level or above, and to demonstrate reading knowledge of a foreign language by completing a literature course in that language. How to research literature, structure related arguments, and communicate your thoughts orally and in written form. How to write a textual analysis. How to use literature to understand and affect the world around us. The J. Fannin King Memorial Award for Excellence in Comparative Literature is awarded to an outstanding senior in comparative literature. At Clark, your education extends beyond the classroom. LEEP Center advisers can help you choose from a range of opportunities that complement your coursework and let you put your comparative literature knowledge into practice. The comparative literature major is designed to help you learn outside the classroom. Many students take advantage of internship opportunities during the academic year or over the summer to connect what they’re learning with their professional development. In alignment with Clark’s LEEP philosophy, participation in a Study Abroad and Away program is an opportunity to gain world and workplace experience that complements your on-campus work. Clark approves semester, yearlong, and summer opportunities to earn credit through academic coursework, internships, community-based learning, or research. Explore our Study Abroad and Away page, where you can search programs by academic interest, location, and language. After you’ve identified some appropriate programs, ensure they fit into your four-year plan by talking with your faculty adviser as early as possible. Clark is committed to action-based learning, which means that as an undergraduate you can join faculty and graduate students in their research (and/or creative work). 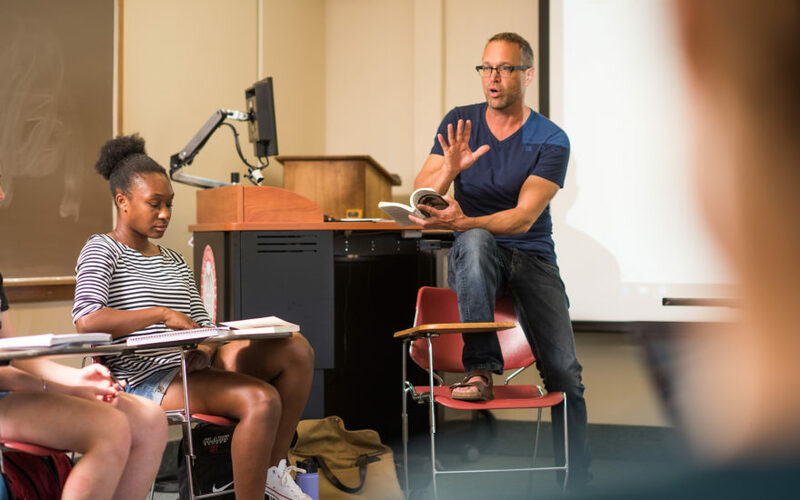 Because the comparative literature major is multidisciplinary, faculty expertise covers a wide range of subjects, including foreign languages, English, history, philosophy, and women’s and gender studies. You can also apply for funding to support your own research on a project of your choice during the academic year or during the summer. NOW’s stance on Gay Rights: The Lavender Menace and The Lesbian Continuum. The comparative literature major prepares you for a wide variety of career paths. In fact, it’s an excellent “pre-professional” major because it is so adaptable, combining critical thinking skills with a global perspective on the world. Graduates go on to rich, fulfilling careers in fields as diverse as publishing, education, advertising, and museum curation. Suffolk Law School, Boston, Mass. ; J.D. Teach for America: Bronx Bridges High School; Bronx, N.Y.
Rhode Island Hospital; Providence, R.I.
Sun Microsystems; Santa Clara, Calif.
Elizabeth Glaser Pediatric AIDS Foundation; Washington, D.C. Explore the concept of a national community as created and critiqued through cultural texts like literature and film, and how a national language can promote a sense of cultural continuity and identity. Since its defeat in WWII, Japan has moved from atomic desert to economic powerhouse. Explore how the work of Japanese artists has reflected memories of post-war trauma and engaged issues of national identity. Hone your Spanish while exploring Spanish films of the past 25 years in the context of political and social change in Spain, and consider how cultural ideologies and identities are formulated in this medium. From Genesis to Kings, the first half of the Hebrew Bible can be read in many ways — as history, myth, or religious program. See how different peoples came to view their own stories through those found in the Bible. Through readings, class discussions, and outreach to local human rights organizations, you’ll trace the meaning of human rights — along with who counts as human — from the Age of Enlightenment to the present day. Use psychoanalytic and Frankfurt School criticism to gain insight into masterpieces of German-language cinema, including those by expressionists, Nazi, and queer German filmmakers, and post-WWII directors. Explore what the Language, Literature and Culture Department has to offer.